The cost of the expedition includes photo shoots, editing and multimedia guidance, transfer services from airport-hotel-airport, hotel accommodation with breakfast, local fixers (subject to locations), taxis/car to venues (if not within walking distances) and boats (for river shooting). It does not include meals, any expenses of personal nature, laundry, or any beverages. A deposit of $500 is required to secure a place on the Kolkata"s Cult of Durga Photo Expedition™. This down payment is fully refundable if notice is given 120 days prior to the departure date. The balance of the cost is due 120 days prior to departure date. Our travel agent is based in Delhi, and has arranged many of The Travel Photographer's Photo Expeditions all over India. We shall be staying in a three-star centrally-located hotel during this photo-expedition. All rooms have attached private baths. Eating in Kolkata's restaurants is inexpensive, varied and enjoyable....especially Bengali traditional food. I assume no responsibility for accidents or injury to individuals participating in the Kolkata's Cult of Durga Photo Expedition/Workshop™. You will be requested to read, accept and sign an agreement which releases me from any responsibility of liability in the event of any of the situations mentioned below. I cannot assume any liability whatsoever for injury, sickness, damage, death, loss, accident or delay to person or property due to an act of negligence of or default of any travel agent, hotel, carrier, restaurant, company, airline, or person rendering any of the services included in the Kolkata's Cult of Durga Photo Expedition ™, or by act of God, act of war or terrorism. Further, no responsibilities are accepted for any damage, changes or delays due to sickness, pilferage, labor disputes, machinery breakdown, quarantine, government restraints, weather or other causes beyond my personal control. No responsibility is accepted for any additional expense, omissions and schedule changes, forced stopovers, rerouting or acts of any governments or authority. I reserve the right to decline or accept any person as a member of any tour or to cancel or alter the tour without notice. It is also the responsibility of the traveler to keep informed on deposit and payment date requirements. It is highly recommended that all individuals obtain adequate travel insurance. Kolkata is the cultural capital of India and its metropolitan area has a population of more than 15 million, making it the third most populated metropolitan areas in India after Mumbai and Delhi. Three quarters of Calcuttans are Hindu, while the rest are Muslims, and other minority religions. Kolkata's Durga Puja is the most important religious festival of West Bengal, and it celebrates worship of the Hindu goddess Durga. Due to its importance, it's the most significant socio-cultural event in Bengali society of the year. Durga Puja also includes the worship of Shiva, Lakshmi, Ganesha, Saraswati and Kartikeya deities. Representations of these deities (known as murtis) are created from special clay, and the entire process from the collection of the clay to the ornamentation is a holy process, supervised by rites and other rituals. MULTI-PRONGED: As befits the context of this photo expedition/multimedia workshop, our objectives will be multi-pronged; the primary aim will be to photograph the innumerable rites associated with the Durga festivities, documenting some of the ornate pandals (platforms on which the deities are displayed), and ultimately their immersion in the city's Hooghly river which we shall photograph from the ghats and from rowboats. As Kolkata offers a diverse, gritty, and a visually compelling environment to delight photographers, this is also a "street-photography-heavy" workshop, during which we shall seek to document the lives of rickshaw pullers (remember City of God), the activity in Sonagachi (the red-light district) subject to safety considerations and acquiring permission to do so, the massive flower market, the temple to Kali at Kalighat, and photograph the various ethnic enclaves of Kolkata such as Chinatown, and the Jewish synagogues. It will entail photographing during the day and at night. OBJECTIVES: Emulating real-life photo assignments, the aim of the workshop is to assist its participants produce 2-3 multimedia bodies of work ready for publishing. Participants will merge their still photography and audio to create compelling narratives. While black & white photography may lend itself better in the context of this particular workshop, it is left to each participant to decide on whether to produce narratives in color or monochrome. Participating photographers will have to own/use portable audio recorders, and specialized audio-slideshow software. WHO FOR: The Kolkata's Cult of Durga Photo~Expedition™is structured for photographers interested in documentary photography, ethno-photography and multimedia, and for those ready to create visual projects from their inventory of photographs, and learn how to control story length, intent, pace, use of music and ambient sound, narration, field recordings and interviews. The Travel Photographer's Photo~Expeditions™ are best described as a mixture of documentary photojournalism, ethno-photography and travel photography" adventures. As with other previous expeditions, the Kolkata's Cult of Durga will include both documentary-style (candid and on-the-run) photography, as well as posed photo sessions with selected people we may encounter (the rickshaw wallahs as an example). Tewfic El-Sawy is The Travel Photographer, a freelance photographer who specializes in documenting endangered cultures and traditional life ways of Asia, Latin America and Africa, has been organizing and leading photo expeditions since 2000. He's enthusiastic about documentary-travel photography and produces multimedia stories, merging still photography and ambient sound. His favorite destination is India, which he visited no less than 18 times. 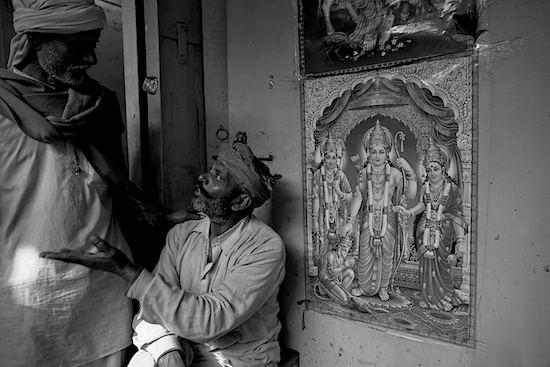 He recently published DARSHAN, a book of his photographs of India. He's also a faculty member of the Foundry Photojournalism Workshop, tutoring the essentials of multimedia to emerging photojournalists. 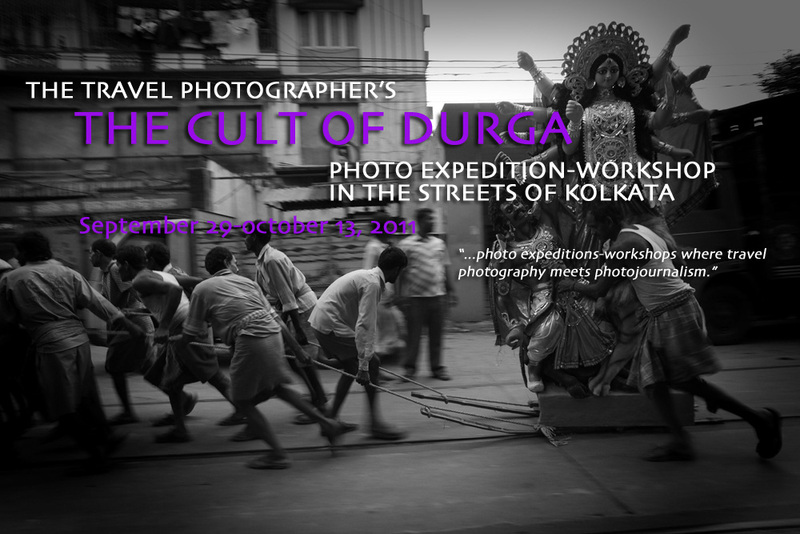 Important Notice: The Kolkata's Cult of Durga Photo Expedition™ is limited to 6 participating photographers only. It is not for first timers to India, nor for starting photographers. Participation is subject to a portfolio review.